Walnut Woods, located only minutes southwest of Des Moines, provides shaded picnic areas with fireplaces and tables and peaceful spots for river fishing. The park is open year-round and is perfect for hiking, snowshoeing, and cross-county skiing with 2 1/2 miles of trails. A pleasant equestrian trail is also located in the park. 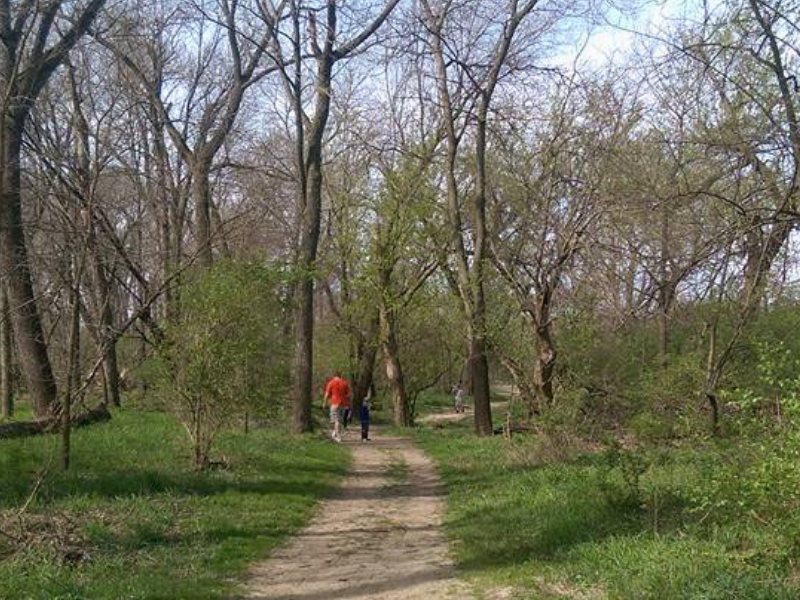 Walnut Woods encompasses 260 acres of wooded bottomland along the Raccoon River. Within the park lies a large surviving natural stand of black walnut trees. More than 90 species of birds have been identified along the numerous foot and bridle trails throughout the park and along the river. 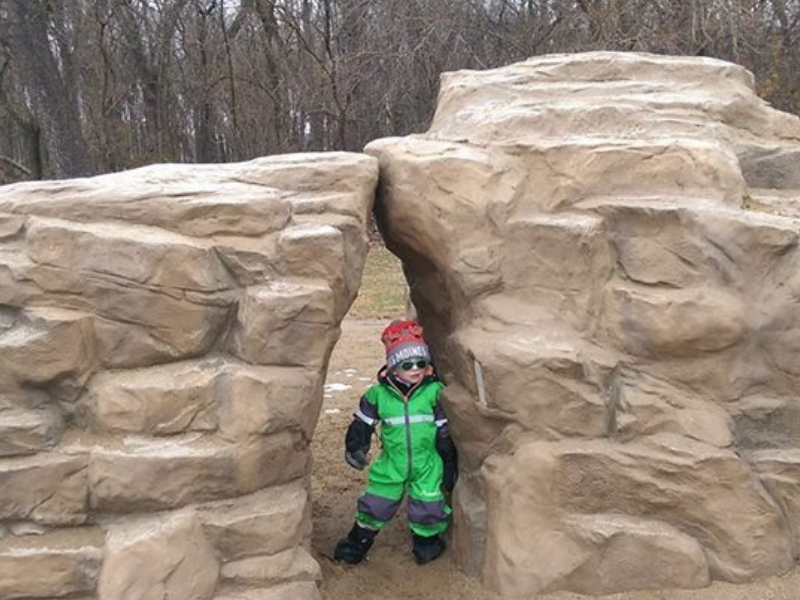 There is a 1-mile loop starting at the playground and ending at the bird blind that is perfect for young walkers. The trail is sand for the first half and then dirt for the second half. The sand can make it difficult to navigate strollers. 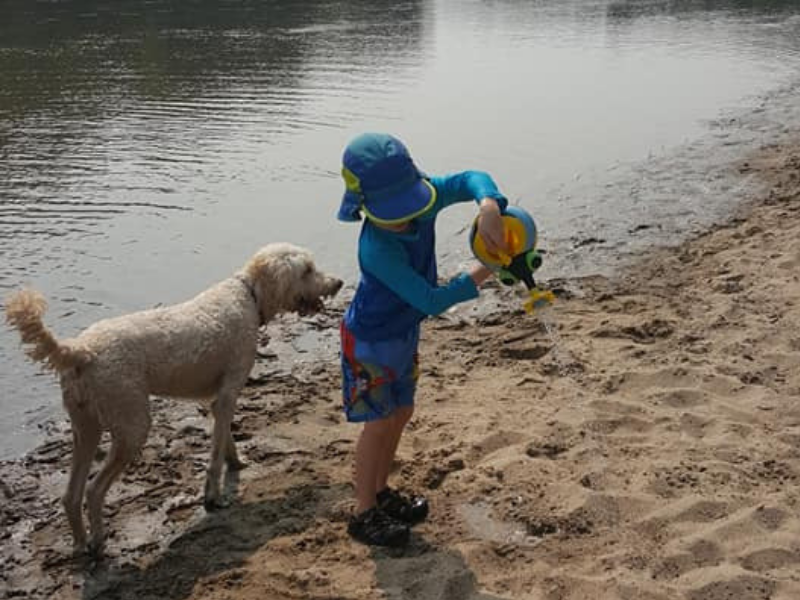 The trail follows the Raccoon River for most of it, providing beautiful views and several spots that allow you to walk down to the river and play in the sand and/or water. During the loop, you will come to two trail junctions. Take a right for both of them to make this a 1-mile loop. It will end at the bird blind and you can easily walk back to the playground from here. If you take a left at the first junction, you will see the access point to one of the sandbars and the perfect place to building sand castles. If you take a left at the second trail junction this will put you onto the longer trail system that encompasses the park. There are several places to access the river from the trail and play on sandbars. We have done several sand castle building hikes here and the kids love being able to play in the water and sand after hiking. This park also has a small campground which is perfect if you want a camping experience that feels like you’re in the middle of a forest, but is only minutes from town and needed amenities. This park is operated by our local DNR program. In the summers there is a park naturalist there who regularly schedules hikes and other fun educational events at the park. There is a parking lot loop at the playground, across from the lodge. You can park here to start the hike and end back at the playground (which is fun for kids!). You can also park at the bird blind which also has a parking lot loop and hike the opposite direction. 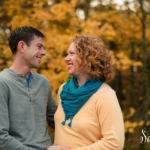 My name is Katy Severe and I am one of the Branch Ambassadors for Hike it Baby Des Moines. Our branch has been active since 2015 when I helped start it with another mama. I grew up in Eugene, Oregon where I got into hiking and the outdoors in high school when I joined my local Search and Rescue group. Hiking has continued to be a favorite hobby of mine ever since then. We moved to Iowa in 2011, our son was born in 2014, and hiking took on a new meaning for us a family. We wanted our son to grow up appreciating nature and getting outside in it. We love Hike it Baby and all that is has done to help encourage families with young children to get outside.